Reading academic articles about Internet-wide routing challenges you might stumble upon valley-free routing – a pretty important concept with applications in WAN and data center routing design. If you’re interested in the academic discussions, you’ll find a pretty exhaustive list of papers on this topic in the Informative References section of RFC 7908; here’s the over-simplified version. Imagine a typical multi-layer somewhat-hierarchical routing structure. 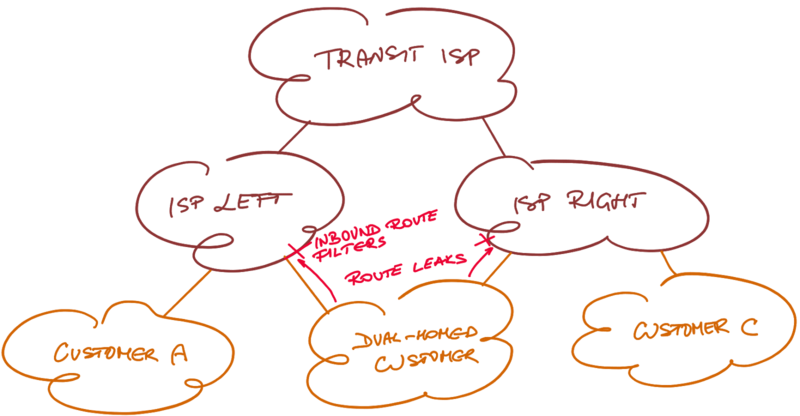 It could be a hierarchical WAN design, data center fabric, or the global Internet (we’ll focus on the latter in this blog post). You’d expect the traffic to flow from the source leaf node up the layers until it hits a path toward the destination leaf node where it makes a turn and starts flowing down the layers until it gets to the destination leaf node. Unfortunately life isn’t always as neat and tidy. For example, a dual-homed customer could create a route leak due to incompetence or fat-finger incident and become a transit AS between ISP Left and ISP Right. 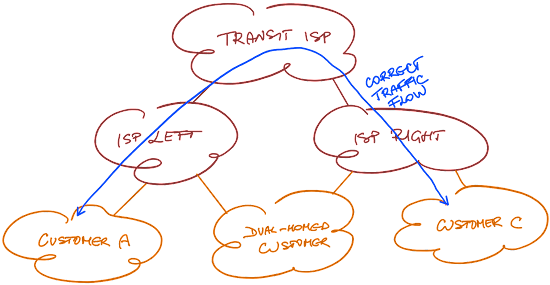 Assuming our understanding of routing hierarchy is correct, the traffic from Customer-A toward Customer-B goes uphill, then dips into a valley (dual-homed customer), goes uphill again, and finally goes downhill to reach Customer-B. 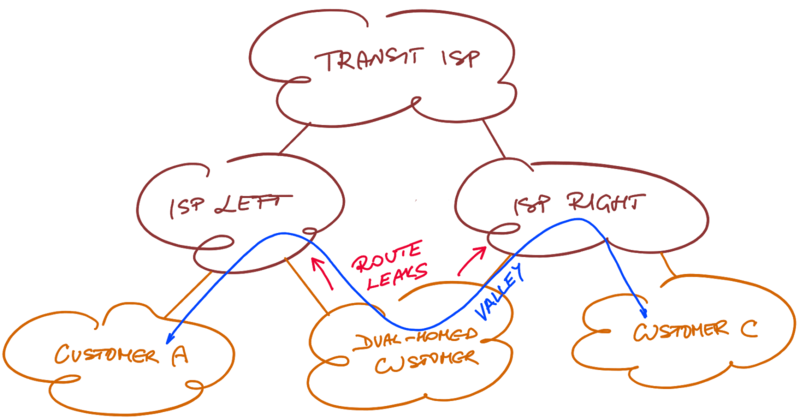 Loose definition: A routed network with no traffic flow valleys for any source-destination pair has valley-free routing. 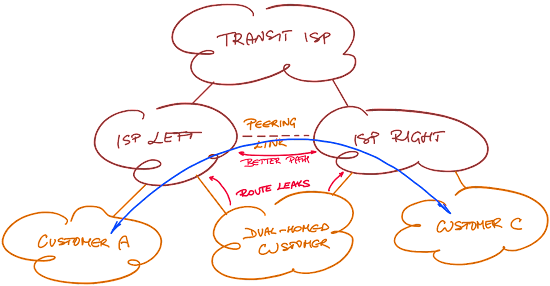 If you can’t influence the routing protocol policies, install a peer link between elements at the same hierarchical level to create a lower-cost path than a path through the valley. 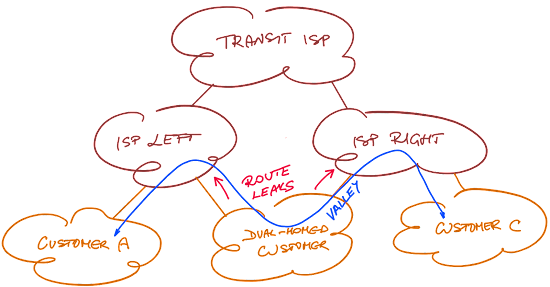 Ideally, you’d use routing protocol policies to stop (or at least discourage) route leaks that result in traffic flow valleys. 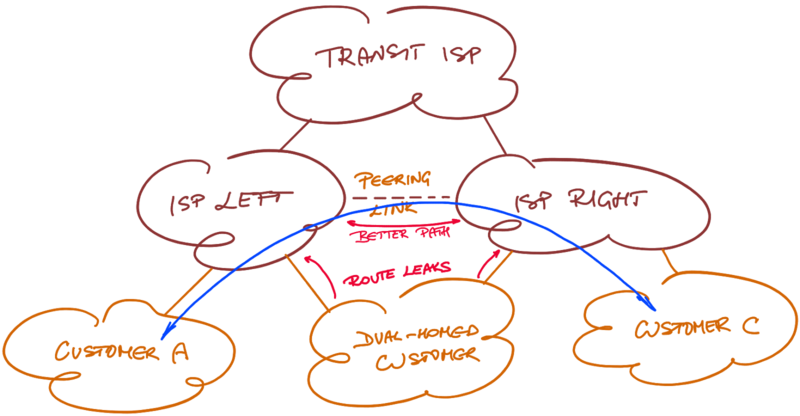 As explained in tedious details in RFC 7454, the two ISPs in our example should filter transit routes received from their shared customers. In an environment that favors reachability over stability or predictable traffic patterns, a better solution might be to increase the cost (or reduce local preference) of routes that would result in traffic flow valleys. Assuming we can assign hierarchical level to network nodes such that the core nodes have the lowest level and the edge nodes have the highest level, a valley-free traffic flow traverses nodes in non-increasing order of levels until it reaches the innermost node, at which point it starts traversing nodes in non-decreasing order of levels. Number links between autonomous systems as (+1,0,-1) for (provider, peer, customer). A valley-free path has a sequence of +1s, followed by at most one 0, followed by a sequence of -1s. ipSpace.net will start getting more formal on October 8th with Network Connectivity, Graph Theory, and Reliable Network Design webinar by dr. Rachel Traylor. Assigning hierarchical levels to network nodes is a fun problem to solve. You could do it manually, automate the process, or try to deduce node’s level in the hierarchy based on its surroundings – RIFT and OpenFabric are both trying to do that to enable plug-and-pray fabric autoconfiguration. The real fun starts when you’re trying to figure out the hierarchical levels of network elements based solely on network topology… and you have to deal with peer links on any level of hierarchy. Anyways, I’m an old-school micromanager and prefer to have a structured network design and automated deployment. If you’re like me, you’ll find a data center fabric automation use case by Dinesh Dutt in Network Automation Use Cases webinar, deep dive into the tool he used in Ansible for Networking Engineers webinar… or you could go for a full-blown course on designing, developing and deploying a network automation solution. So the unfortunate outcome is that we'll see route leaks even in the future. Our hope relies upon people like Job Snijders who are passionate about building a better internet. I miss the phrase "...is nothing new". The problem exists for decades but now they gave a name to that thingy. Getting plug-and-play (or plug-and-forget) working correctly and surviving any stupidity the user (or third-party $vendors if you have to cope with them) could throw at it is a really hard problem... as Microsoft discovered years ago. BTW, that's where "plug-and-pray" comes from. I hope RIFT track record will be infinitely better than that. Do We Need Leaf-and-Spine Fabrics?